With Google Glass now being made available to anyone with $1500 to spend, there are enough issues about pain popping up with the wearable device, that some feel that the connected specs should come with a warning label for users. Most of the issues are occurring to people who are not used to looking upward for long stretches of time. Google has hired Dr. Eli Peli, a Harvard trained optometrist, to consult with them on issues involving the eyes and the connected specs. When Google placed the lens ahead of, or below the eyes, it obstructed the line of view for Google Glass owners. By situating the lens on the upper right of the eye, it offers Glass users an unobstructed view, but at the cost of experiencing some eye pain. According to the optometrist, the connected specs are designed for users to take quick glances through the lens to view maps, taking a picture or reading text messages. They are not designed to be used to view a streaming movie from Netflix. But Dr. Peli says that when people buy Google Glass, the first thing they do is continually use the specs and play with the settings. The Dr. admits that this happened to him as he suffered from the same pain that many new users experience. Dr. Peli says that the pain falls short of being a headache. Instead, he describes it as a "discomfort in the eye muscles." 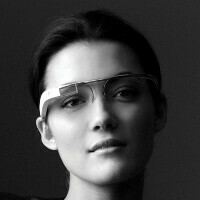 Most users find the pain going away after one to two weeks of Glass use. Google has not published any warnings with the device, something that probably will need to be addressed. Chris Barrett, who at one time was a big fan of the wearable, had to stop using Glass because of the pain he experienced. Part of the problem is that Glass forces you to stare at an area that most people are unaccustomed to looking at. As for Google's response, the company says that the pain is similar to the discomfort felt when someone uses a new prescription lens for the first time. And Google agrees that the connected specs are designed for what Google calls "micro-interactions," not to read War and Peace. You're wearing it wrong ™. LOL trolls gonna troll, They hired an expert to help fix the problem, unlike Apple and their high tech rubber bands/hand angling fix. Right, lets just give up on it on first try and replace it with high tech smart health wrist band watch, you know...real innovation and game changing technology. Real long first try. You'd think Google would be on try 15 by now. Well that's just how long it takes to make a good product that really is future tech. While Apple and all hunt for that next mystery cash cow by patching together useless crap into a wrist watch, at least Google is pushing the limits of innovation with Glass, robots, self driving cars, diabetes detecting contact lens, etc. No other consumer oriented company is even attempting anything close to even one of those much less all of them. You know what is FUNNY!? You bring Apple into every article when your feelings get hurt, out of no where. LOLOLLOLOLOLOL. LOL, are you downs or something? Or did you not read the OP comment? Or are you just trying to save face by going full retard (or troll, whatever you want to call it)? Final, picture this. "Doctor, it hurts when I press there." "Then don't press there." All 113 owners of Glass are very sad at this sarcasm. anyone ever experienced fatigue looking at a computer screen? or typing on a keyboard? No, because it's not 2 centimeters in front of my eyeballs. Not me. And I use my laptop at least 10 hours every day. I love Google just as much as I love Apple bro. I think the Smart Eyewear is a gimmick regardless. Thats my 100% honesty. Yup, might suffer from fatique [sic] even the writer. When I saw the article title, I immediately thought of the movie The Jerk with Steve Martin. Hope they won't be left cross eyed. I wonder, couldn't they just make with adjustable focus length? so you know you didn't need to focus close and only with one eye, what if it was in the middle distance or such that you needed to focus for it to be clear? Placing the display in the middle will only make Glass obtrusive, Google didn't want it to be a distraction. Google wanted it to get out of your way while providing only the vital information that is needed. People are used to looking either straight or down and Google wants us to look up. more refering to the focus length your eye needs to adjust to. the actual glass could be where it is now, but the picture could be displayed such that it wouldn't be in focus unless you relaxed your focus in the distance? I see an Optigrab lawsuit in their future. They better invest in soybean and cocoa before all they have is their chair, their remote control, and their paddle ball.